Arabic: Rutreyt, Kammun Kermany, Ghassoul, Balbal, Tartir, Bowa. 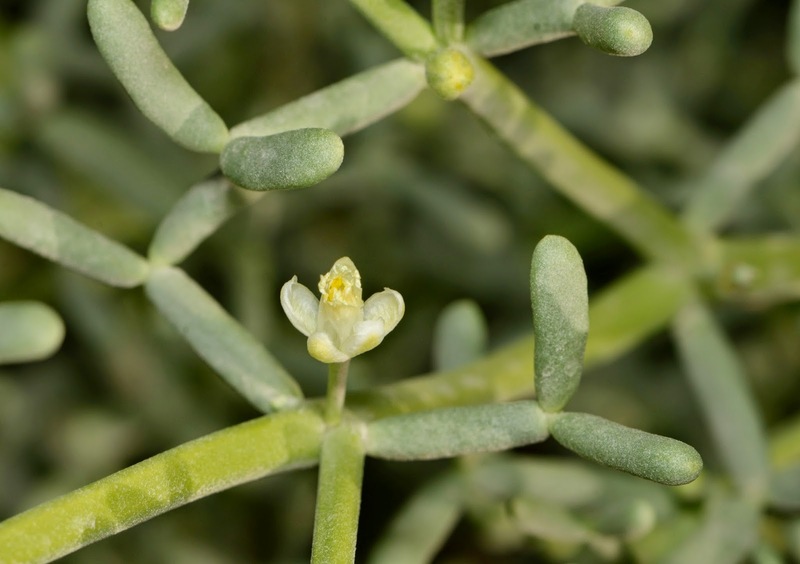 Low shrub, perennial herb or desert succulent undershrub, up to 75 cm high. Numerous stems, branched, erect, the young branches being green. Leaves 2-foliolate, over 10 mm long, cylindrical, bright green, glabrous, fleshy carried on a fleshy long petiole. Stipules broadly triangular, membranous. Flowers are solitary, axillary, white. Capsule 5-valved, 8-10mm long, with obtuse apex. 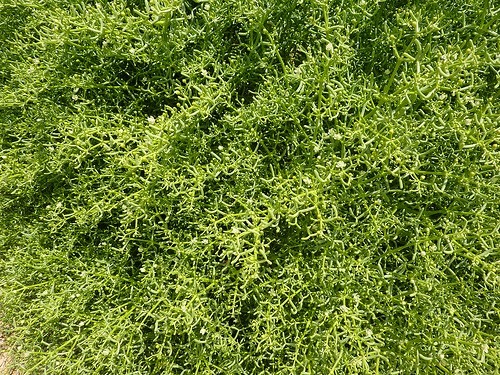 The leaflets and sometimes the petioles are shed under severe dry conditions to reduce the transpiring surface. The fleshy cortex of the stem is shed under these same conditions. Local: Arid zones of Egypt (Eastern and Western Desert and Sinai Peninsule). Regional: Syria, Palestine and Sudan. Zygophyllum coccineum is the most widespread Zygophyllum species in Egypt and grows in diverse habitats and different soil types. 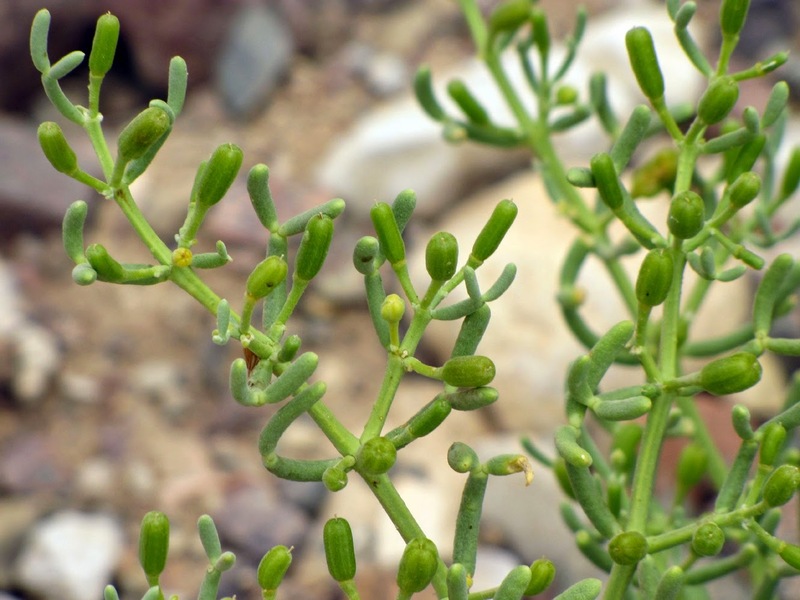 The plant is very common in the limestone wadis and plains of the Eastern (Arabian) desert and tolerant of saline soils. It dominates a community of widespread occurrence there. Zygophyllin (28% in leaves, 0.18% in stems and 0.26% in fruits). Quinovic acid (0.36% in leaves, 0.31% in fruits and 0.47% in stems). Flavonoids e.g, kaempfero1-3- rutinoside. Aqueous extract of the plant is documented to produce a lowering in blood pressure, and acts as a diuretic and antipyretic, local anesthetic, with anti-histamine activity, stimulation and depression of isolated amphibian heart, relaxation of isolated intestine, contraction of uterus and vasodilation. The extract antagonized acetyl choline action on skeletal muscle, and acted additively to the muscle relaxant effect of d-tubocurarine. It is a plant of North Africa and Arabia. Batanouny, K.H. and Ezzat, Nadia H. (1971). "Eco-physiological studies on desert plants. I. Autecology of Zygophyllum spscies growing in Egypt". Oecologia ( Berl. ), 7:170-183. El-Moghazy, M.A (1957). "A comparative study of the common Egyption Zygophyllum species". Ph.D. thesis, Faculty of Pharmacy, Cairo University. Elgamal, M.H.A., Shaker, K.H., pollmann, K. and Seifert, K.H. (1995). "Triterpenoid saponins from Zygophyllum species". Phytochemistry. 40(4): 233-1236. Saad, S.F., Saber, A.H. and Scott, P.M. (1967). "Pharmacological studies on Zypophyllin and Quinovic Acid" . Bull Fac . Pharm Cairo Univ, 6(1): 253-263. Saber, A.H. and El-Moghazi Shoaib, A.M. (1966). j. Pharm.Sci.U.A.R.7:117. Saber, A.H.and El-Moghazy, M.A. (1960). J.Pharm.Sci.U.A.R. 2. Batanouny, K. H., (1999). "Wild Medicinal Plants in Egypt". (With contribution of: E. Aboutabl, M. Shabana & F. Soliman). With support of the Swiss Development Co-operation (SDC). Academy of Scientific Research and Technology, Egypt. The World Conservation Union (IUCN), Switzerland. pp. 187-188. Boulos, L. (2000). "Flora of Egypt", volume two, pp. 24, printed by Al Hadara Publishing, Cairo, Egypt. Rizk, A.M and El-Ghazaly, G.A. (1995). "Medicinal and poisonous plants of Qatar", pp.229. Scientfic and Applied Research Center, University of Qatar. Tackholm, Vivi., (1974). "Student`s Flora of Egypt". 2nd edition, Cairo University, Egypt.